This recipe, from Mary Edwards, won a Cook It Frozen contest sponsored by Alaskan Seafood. It's also visible on the Cook It Frozen website. In a large skillet or Dutch oven, combine the first seven ingredients. Rinse the crab clusters to remove any ice crystals and pat them dry. Add the split crab clusters to the oil mixture and tightly cover with a lid. Over low heat, bring the crab to a slow simmer. 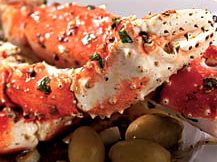 Turn the crab clusters, add the olives, and continue to simmer, 2 to 3 minutes. Remove from heat and allow the crab to rest, covered, until just warm. Transfer to a large bowl, garnish with additional parsley if desired, and serve family style with crusty bread for dipping. This dish serves 8 as an appetizer or 4 as a main course. Read more in Ashley Griffin's article about competitive cooking.